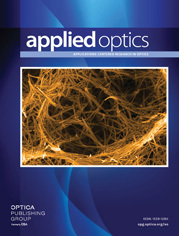 The author is with Nippon Sheet Glass Company, Ltd., Central Research Laboratory, Konoike, Itami 664, Japan. A gradient index (GRIN) lens, when processed by a spherical curvature at its endface, yields the equivalent aspheric effect, if the curvature is adequately optimized with refractive index distribution coefficients. Aplanatic lens systems of infinite or finite conjugates can be made by utilizing the new type of GRIN lens.